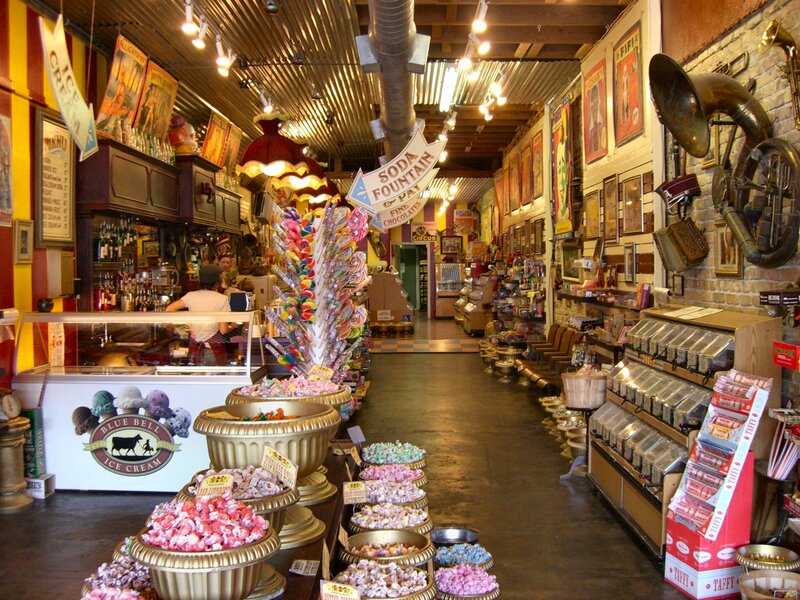 Austin From Scratch: An Interview with Brandon Hodge, Founder of Big Top Candy Shop | Shafer...Power! Austin From Scratch is our favorite series on the blog and involves Owen (age 8) and Malia (age 5) interviewing local entrepreneurs who have created a thriving business here in the heart of Texas. For this session, we sat down with Brandon Hodge, Founder of Big Top Candy Shop. The kids selected Big Top for pretty obvious reasons — and I supported the decision because their love of candy just might have come from me. Two things happen when you walk into Big Top with your children: as an adult, you’re transformed back to your childhood (when candy was at the center of your world) and as a child, you throw your hands up in celebration and do some sort of happy dance. (I actually did both.) That’s right, this place is a sugar lover’s paradise. When we met Brandon to do our interview, the first thing he said was, “Would you like to try our Red Velvet Truffles?” Um…OK. That’s right, this guy was for real. In fact, before we even sat down with Brandon to begin the interview both kids had gum in their mouths. But that’s totally acceptable – and probably expected – at Big Top Candy Shop. I grew up in a small town in southeast Texas so we didn’t have quite as many things to do as you do now. I grew up in the country on a chicken farm so I did a lot of work with chicken and livestock and I spent a lot of time in the woods and swimming in my grandfather’s pond and doing a lot of very rural things as opposed to the urban things I’m up to now. I also did a lot of fishing. I real a lot of books and I was very fortunate to have two parents who were very eager to feed into my eagerness of what I wanted to learn. We had a lot of encyclopedias that I spent a lot of time with. I played a lot of games and board games as a child and believe it or not I learned a lot of stuff from role playing games such as Dungeons and Dragons. It taught me a lot about mythology and cultures and how to think about and register different types of information that I wasn’t exposed to otherwise. But mostly I read a lot of books; in fact, I felt self-educated in that regard but was lucky to have good teachers too. Would you like to tell Brandon what book you’re reading right now? I’m reading Charlie and the Chocolate Factory. Ah, nice…good, good, good…good choice! It’s much different than the movie. It wasn’t that long ago. I never felt like it I really….I mean, it was obviously a choice I had to make. Since I grew up reading so much I always wanted to be a writer. I wanted to write and I wanted to teach and that’s why I moved to Austin. I came here to learn how to write and get an education to be a teacher. After I graduated from college, I had worked for eight years at a toy store that was just a block from Big Top and after I graduated from college, I learned that I made more (money) at this locally owned toy store than I would have as a teacher. And I got to make my own schedule and it was going to be really hard to give that up to go teach. And then that toy store closed and I tried to get into writing but realized all of my experiences were in retail. So I was having a hard time getting someone to hire me to write because I had spent all of time in college working in a toy store. After trying to write for a while and not getting any jobs as a writer I decided to open a shop. So I had to weigh my real world education versus my college education and the real world won out. And I went back and opened a shop and that was Monkey See Monkey Do!, which is three doors down and is still alive and kicking. I love the freedom that being an entrepreneur presents. Ya know, any mistakes that I make, I don’t have to answer to anybody but myself. And also, I get to make my own schedule and I get to spend more time with my wife and child. The other thing I really enjoy is providing that same benefit – that same employment – that I got to enjoy. When I was in college, I worked for a local business that allowed me to make my own schedule and who treated me very well as an employee and gave me the freedom to pursue other interests. And so I try to provide that for my employees; I try to take care of them the best I can for a toy store and candy store and treat them well and let them pursue their other interests because they’re not going to work here forever and I recognize that. But while they’re here, I hope to give them the freedom to pursue their other interests so they can become writers or teachers or whatever it is they’re going to school to become. What would you be doing if you weren’t running Big Top? If I wasn’t running Big Top or Monkey See, I would probably be writing. The irony is that after I got really busy with two shops, I became a very popular writer and so now I have to spend a lot of my time writing when I’ve got two shops to run. So I get to pursue two dreams at once. If I didn’t have these two shops, it would be a much harder way to make a living but I would probably write full time. Ya know, I didn’t have a lot of advice given to me before I started off so I learned a lot of lessons the hard way. I was say do your research, know what you’re doing and before you become an employer be an employee and learn what it is that you’re going to be doing. I did that for eight years. I was an employee as long as I’ve been a business owner and without that experience, I don’t think I would have made it. And so I would definitely say whatever business an entrepreneur is getting into, to not just go in blind…actually learn what you’re doing before all the risk is on your shoulders…because that’s part of being an entrepreneur is taking on the risk of those businesses. You can mitigate that risk by learning as much as possible about what you’re going to do. Well, Monkey See (Brandon’s other retail store) had been open for three years and we were about to open another location in Colorado. And I wasn’t very sure about it but I started to move forward with a circus them for our second store so the circus aspect (of Big Top) is an outgrowth of what I was working on for my other business. And during the process, we were in Colorado and there was a candy store along Pearl St. in Boulder and I had recently been in San Francisco and had seen some candy stores there and we got back to Texas we realized we were really missing a candy store here on South Congress and I thought it would be a good fit. So when that second location for Monkey See didn’t work out, I was offered this location by my landlord and they wanted to see what other ideas I had so I presented them with the idea of a circus-themed candy shop and they liked it and we started working on it. Interviewing Brandon at Big Top Candy Shop was a blast and probably one of our more inspiring interviews. In fact, on the drive home I overheard Owen asking Malia, “Are you going to start you own business?” To which she responded, “Yes. Are you?” Owen paused for a few moments (most likely so he could daydream some more about Big Top) and stated emphatically, “For sure!” Thank you Brandon!